During July–August 2007, a salvage excavation was conducted in the village of Mi‘ilya, between the Catholic Church and the Crusader fortress on the eastern hill (Permit No. A-5202; map ref. NIG 22471–2/76993–4; OIG 17471–2/26993–4), prior to construction in the church square. 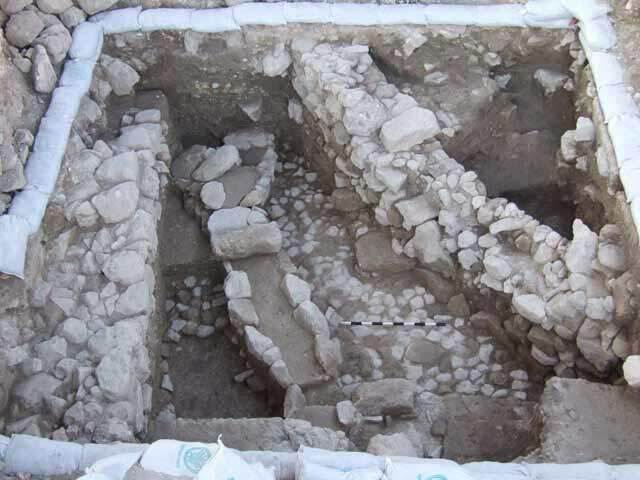 The excavation, undertaken on behalf of the Israel Antiquities Authority and underwritten by the Mi‘ilya local council, was directed by L. Porat, with the assistance of Y. Ya‘aqobi (administration), A. Grishna (registration), A. Hajian and M. Kipnis (surveying and drafting), A. Shapiro (GPS), H. Smithline (field photography), M. Hartal (guidance) and laborers from Kafr Manda. The author wishes to express her gratitude to A. Yassur, E.J. Stern and N. Getzov for their valuable assistance in reading the ceramic artifacts. The eastern part of the Mi‘ilya village is located on top of an ancient tell at whose summit stands a Crusader fortress (Castellum Regis) from the twelfth century CE. A survey conducted in the village and its surroundings recorded potsherds from the Middle Bronze, Late Bronze and Iron Ages, as well as from the Hellenistic, Roman, Byzantine, Crusader, Mamluk and Ottoman periods (IAA Reports 14: Site 161). 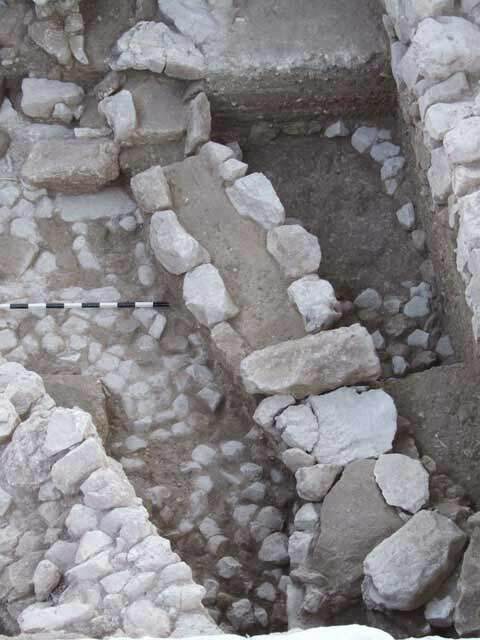 One square was opened and excavated to bedrock, revealing four archaeological strata that dated to the Late Bronze Age, Iron Age and the Crusader period (Fig. 1). Stratum IV. The bedding of a floor, built of medium and large stones and overlain with the scant remains of a wall, was exposed above bedrock (chalk; depth below surface 2.35 m). A floor of tamped chalk, overlaid with animal bones and numerous fragments of pottery vessels that dated to the Late Bronze Age, was discovered above the stone bedding. Stratum III. Two construction phases were identified. The first phase consisted of a channel that was covered with stones (length 5.3 m, width 0.5 m; Fig. 2) and sloped down to the south, splitting off into two branches. The sides of the channel were built of medium and large stones that were not always close to each other and its floor was tamped yellow soil. The channel was built over soil fill in the northern part of the area and its southern part was founded on the stone floor of Stratum IV; its decline was more moderate. A floor of crushed and tamped chalk abutted both sides of the channel at the level of the covering stones. This floor was overlaid with animal bones and numerous fragments of pottery vessels, dating to the Late Bronze Age. A wall (length 4.8, min. width 1 m, height 0.7 m) that was partly exposed in the eastern section of the excavation area was ascribed to the second phase of this stratum. Stratum II. A slightly curved wall (length 4.8 m, width 0.9 m, preserved height c. 1 m), partly built on the wall of Stratum IV, was exposed. A tamped earth floor in the southwestern corner of the square abutted the wall and above it were the remains of a square oven that was built of medium-sized stones and mud bricks. The ceramic finds dated to the Iron Age. Stratum I. A pit (3.0 × 4.5 m, depth c. 0.8 m), which was dug into the earlier strata and severed floors, walls and the covering stones of the channel that was ascribed to Stratum III, was exposed. The pit contained large stones, animal bones and fragments of pottery vessels from the Crusader period, particularly large fragments of amphorae, as well as fragments of glazed bowls that dated to the twelfth century CE. 1. The excavation area, looking south. 2. The channel, looking north.